I hear people puzzle over this question often. Oh, not so much about why I have cancer, but why cancer exists. In a world filled with bizarre, pre-enlightenment notions of “knowledge” that competes for our attention, it’s easy to see why so many would be confused. Luckily, we know exactly why cancer exists. It’s no mystery, and it certainly doesn’t require mystical explanation (though I’ve been astonished at how many attribute it to non-material forces). Cancer happens because change is the fundamental property of living things. That change can happen in populations, or it can happen in individuals. Somewhere along the way, probably in the early 2000′s, one of my b-cells—that important component of the immune system that generates those amazing chemicals called antibodies . . . well . . . got changed. The change was random. I do not use this word—random—in the unfortunate way so many are today, to mean improbable, which is the precise opposite of its actual meaning. The change certainly was improbable in that single cell, in my body; such changes, however, are highly probably across populations where cells are changing all the time. But when I say random, I mean that it was just as likely to occur in the cell that it occurred in as it was to occur in any b-cell, and the change’s occurrence was without direction, without intention. The details of the change in my b-cell are well known, and in my case they were demonstrated genetically in Manhattan at the time of my formal diagnosis with follicular lymphoma. Most say something went wrong; I don’t see it that way. Oh, I’m not one of those infuriating bright-siders who say absurd things like they’re glad they got cancer, or whatever other garbage they have to tell themselves so they can grapple with their mortality. I just know biology, and life is change. 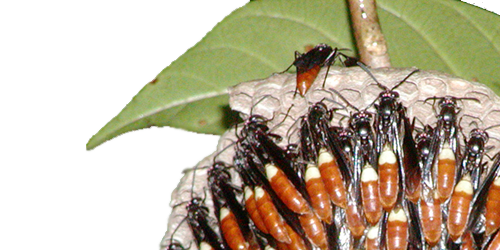 Populations of cells change just as populations of wasps change. One of my cells changed. That’s it. Maybe, it could’ve been an advantageous change, but it wasn’t, at least not for the whole of me (but from the reproductive perspective of the b-cell, it certainly was. . . more on that later). The relevant behavioral change in that singe b-cell allowed it to reproduce without bound, and so it and its daughters have been busy clogging my body with their bodies—with too much of me.